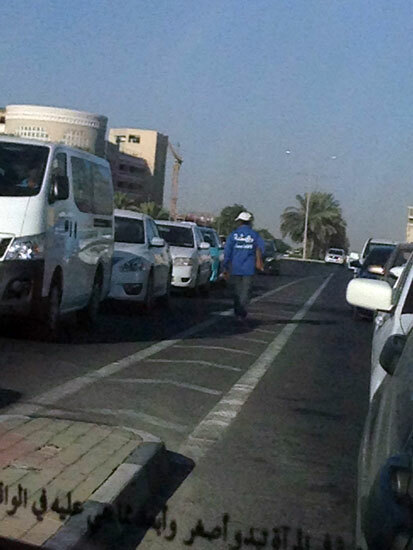 There are ongoing conversations in the media about getting a taxi in Doha. The arguments revolve around an insufficient number of cabs and whether drivers frequently attempt to overcharge in order to make a living. 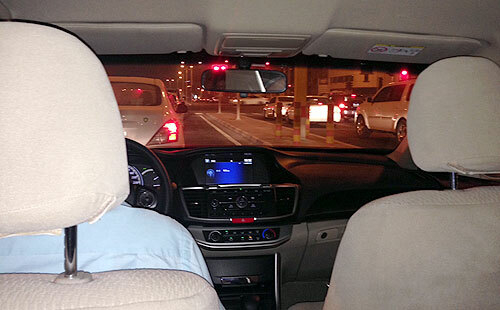 There are also the private drivers who will stop and offer to take you to your destination for an agreed sum, usually more expensive than a conventional Karwa taxi. 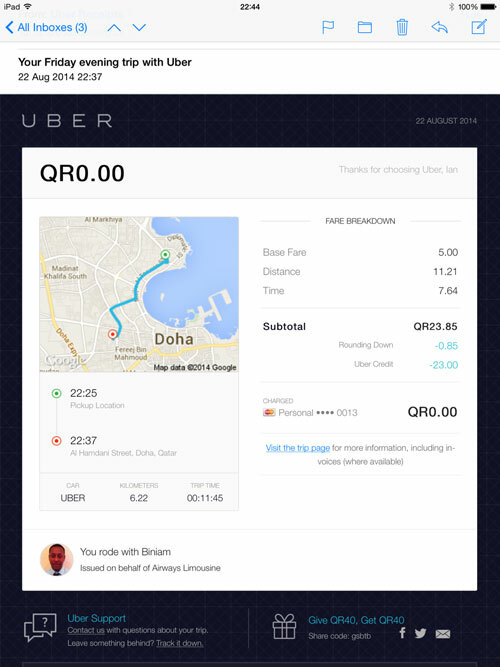 Now adding a further option is Uber, the mobile app which helps you ‘get a taxi or private car from your mobile phone’. It’s now well used in cities across the USA and Europe. I only recently realised it was also available in Doha. I tried it for the first time last night, having registered with Uber a few days before. Once you open the app, the Uber map screen shows all the available cars in the area in real time. I identified my pick-up point and final destination. and requested a ride. Within 30 seconds I received confirmation that pick-up would be in three minutes. The screen showed the approaching vehicle on the map, counting down to arrival time. It also showed me the make and model of the car as well as a photograph of the driver. The car arrived… it was clean, it was comfortable, and we we home in under 10 minutes. No money changes hands other than the tip I gave the driver… it’s all paid via credit card. 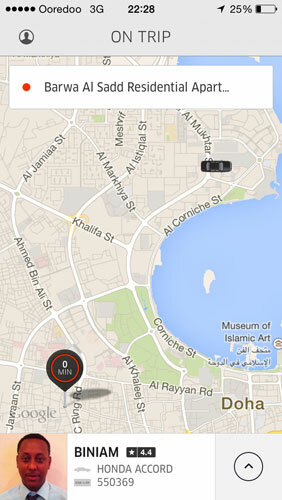 The app allows you to rate the driver… I gave Biniam the full 5 stars…. I will use Uber again. Due to the exceedingly hot and now humid weather, our daily exercise on the Corniche has gone on hold, to be replaced by walks around the local shopping Malls. Villagio offers a mock-Venetian indoor, air-conditioned experience and a 45 minute stroll under blue skies along the canal, round to the designer shops, up along by Carrefour, and back to the fast-food and restaurants where I might reward myself to a Coldstone ice-cream. Ezdan Mall provides less interesting vistas but does have the benefit of being maze like, so we tend to walk much farther than intended in an attempt to get back to where we started. During a late afternoon walk last week, a perfume shop in Ezdan Mall attracted my attention. In the window was a box containing a lump of wood placed on a soft cushion. 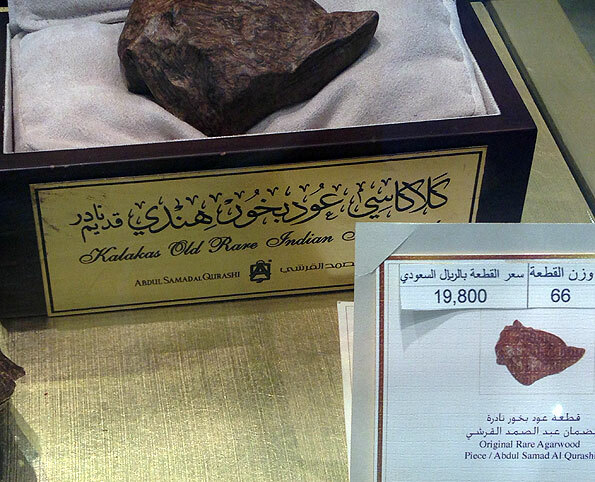 In front was a label telling me I could be the proud owner of the said lump of wood (and I assume the box as well) for 19,800 in Saudi Riyals (£3,200 or $5,400). The wood is agarwood, reputedly, and judging by the sticker price the most expensive wood in the world. It’s used to make Oud, a very popular and expensive fragrance for both men and women in the Arab world. It can also be broken into small pieces and burnt as ‘bukhor’ a pungent incense which makes me cough. I skim the English and the Qatar newspapers online every morning on my iPad before leaving for work. The choice of English language newspapers in Qatar is the Peninsula, Gulf Times and Qatar Tribune. I tend to go for the Peninsula as it downloads quickly as a pdf of the newsprint version rather than an interactive digital version. As well as stores and supermarkets, I could also buy a paper from the men who sell them every morning at the traffic intersections while drivers wait for the lights to change. This picture was taken a 6.45am last Tuesday morning. It was already 40C. He is selling the Peninsula… you can tell because of the blue jacket matching the livery of the paper. Gulf Times sellers wear maroon. He wanders down the line and across the lanes while the cars are stationary. I believe newspapers are around 1QR (17p) so he really needs to sell a lot to earn any money. The photo was taken in the wing mirror of my car. I case you are wondering about the writing at the bottom of the picture, it’s the Arabic version of ‘Objects in mirrors are closer than they appear’, advice that I have never really considered I needed to be reminded of every time I look to see what’s behind me. I don’t need to remind you that Qatar is a hot country, and this summer has been appreciably hotter than last year. This morning, at 7.30am, the thermometer in my car told me that it was 40C. Whilst cooler in the car with the controls on the lowest setting, the air-con even struggles to put out cold air. Later today the temperature will rise to around 46C. All this means that Qatar can be a sweaty place to live. In order to be deodorised and pleasant to be near, I naturally use an antiperspirant. I have tried a variety of products. 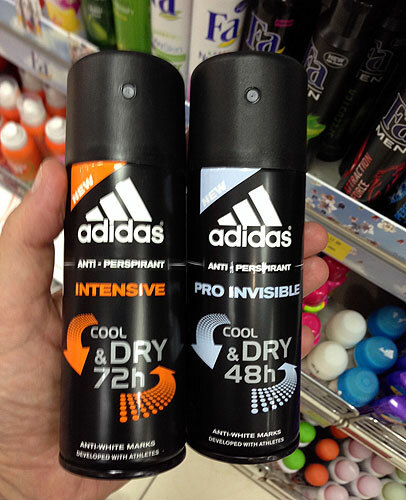 I currently favour aerosols from Adidas, both which are ‘cool & dry’ but also provide anti-white mark. I am, however, confused that one offers to keep me aromatic for 72 hour but the other only for a meagre 48 hours. In marketing terms I am puzzled by two such similar products… personally I would select the 72 hour option every time. Either way I hope and doubt that I will ever require protection for longer than 24 hours, nevertheless it is reassuring to know that even if I can’t take a shower for 3 days in this climate that I will remain untainted by body odours. Ramadan has ended. I am not going to report about it as so much is written each year about the holy month in Qatar. Like many expats we got away for three weeks of the thirty days of Ramadan, escaping the summer heat in the higher 40s, and returning at the beginning of Eid to similarly high temperatures. As we were about to exit the airport arrivals hall on our return, a very friendly man in a thobe greeted us with a warm ‘Eid Mubarak’. 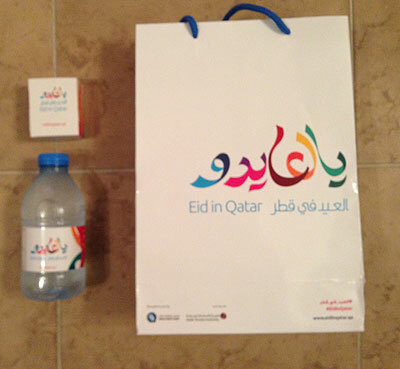 He then presented both of us with a bag containing traditional Eid gifts… a small box of dates, a bottle of water and less traditionally, a glossy leaflet about Eid activities in Doha. A smaller gift bag would have been better as my expectations of the potential contents were somewhat raised by its size. We flew out of and into the new Hamad International Airport, which was a far nicer experience than the old airport. Much more space, more and better seating, more toilets, nicer ambiance, and if you fly Qatar airways, no long bus ride to and from the aircraft. The one downside is that the airport is now farther out of town so that we can no longer leave the terminal and be home in less than 15 minutes.